Posterior Reversible Encephalopathy Syndrome (PRES) is a well-known but uncommon clinical syndrome with acute neurological phenomenon leading to destroying of the blood brain barrier and vasogenic edema on brain imaging. Studies showed PRES occurred in about 1% of liver transplant recipients within 3 months postoperatively. 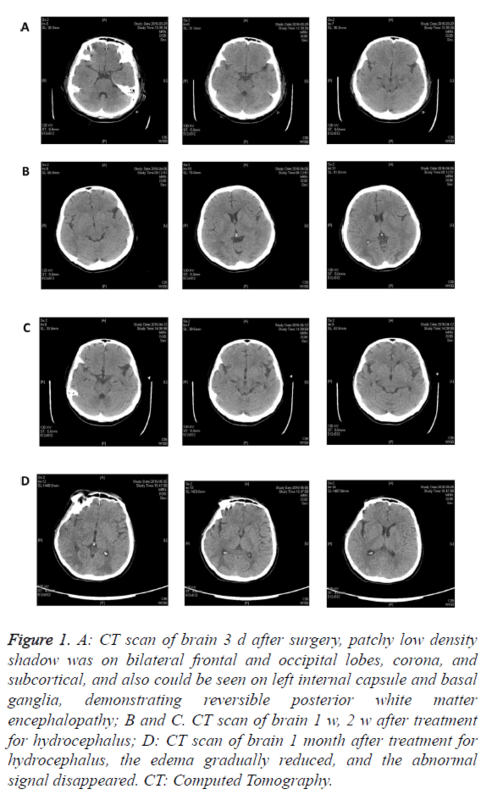 In this paper we reported a case of 43 year-old woman who received orthotopic liver transplantation and reversible posterior white matter encephalopathy occurred 3 d after surgery, complicated with cerebral hemorrhage. Since the lack of clinical data, this report may give additional contribution to the understanding of PRES. Posterior reversible encephalopathy syndrome, Orthotopic liver transplantation, Cerebral hemorrhage. Orthotopic Liver Transplantation (OLT) has become an accepted therapy for end stage liver disease in the past decades. However studies showed lots of surgical complications after surgery which limited its application . Among the complications there is a rare one called Posterior Reversible Encephalopathy Syndrome (PRES), which is discovered by clinical and radiologic findings and has been recognized increasingly in the past decades. PRES is a clinical syndrome with acute neurological phenomenon leading to destroying of the blood brain barrier and vasogenic edema on brain imaging . Though definite cause of PRES is still unclear, studies showed that sickle cell disease, renal failure, systemic lupus erythematosus, sepsis, use of cytotoxic medications and organ transplantation are some of the risk factors that have been associated with PRES [3-5]. PRES is generally identified by radiographic imaging such as Computerized Tomographic scanning (CT) or nuclear Magnetic Resonance Imaging (MRI) . On neuroimaging studies, PRES is classically described by white matter edema in the posterior cerebral hemispheres . In this case, we reported a patient with reversible posterior white matter encephalopathy complicated with cerebral hemorrhage after orthotopic liver transplantation. The case report can provide more clinical data in this field as well as give a reference for deeper understanding to PRES. The female patient was 43 y old, admitted in Chaoyang Hospital in March 26, 2016. She was diagnosed with chronic hepatitis B with the course of disease for 14 years and didn’t pay attention to the disease nor receive any systemic therapy. Four years ago, the patient presented the symptoms of liver dysfunction, such as skin sclera jaundice. What’s more, the patient had stopped taking anti HBV drugs 6 months before admission, and presented cutaneous and sclera icterus 2 months after that. Two months before admission, she went to other hospital for treatment and was given the treatment of liver protection therapy considering the liver dysfunction. However, her liver function wasn’t improved significantly and she was transferred to You An Hospital for further treatment. On admission, she showed a blurred consciousness and indifference in face expression, cooperative in examination. In preliminary clinical diagnosis, she was diagnosed as subacute liver failure, with the duration of 4 months. In addition, the patient was also diagnosed with liver cirrhosis, portal hypertension, jaundice, pulmonary infection, anemia and thrombocytopenia and so on. Laboratory examination showed that the patient had elevated bilirubin and coagulation dysfunction. Firstly, this patient was treated with artificial liver twice. As there is no significant improvement in liver function, on March 26, 2016, the patient received modified piggyback orthotopic liver transplantation surgery. After the successful surgery, she was transferred to the surgical intensive care unit for treatment. The treatments of anti-infection, anti-rejection, protecting liver, decreasing intracranial pressure, CRRT, regulation and electrolyte balance was adopted. 3 d after surgery, the patient presented symptoms of epilepsy, tic of limbs. Head CT indicated bilateral frontal parietal occipital cortex and coronal radiation edema complicated with intracranial hemorrhage, and the left anterior limb of the internal capsule and basal ganglia infarction undetermined (Figure 1A). Associated with condition of the disease, she was finally diagnosed as reversible posterior white matter encephalopathy. The patient was treated with dehydration treatment to alleviate cerebral edema, as well as meropenem and caspofungin for anti-inflammatory and anti-fungal. The patient kept in a state of consciousness and somnolence. 11 days later after the surgery, head CT found right occipital high density range, which indicated hemorrhagic lesion (Figure 1B). Head CT was reviewed on April 12, May 5 and May 12, it showed that in the frontal lobe and the corona, the edema gradually reduced, and the abnormal signal disappeared (Figures 1C and 1D). Figure 1. A: CT scan of brain 3 d after surgery, patchy low density shadow was on bilateral frontal and occipital lobes, corona, and subcortical, and also could be seen on left internal capsule and basal ganglia, demonstrating reversible posterior white matter encephalopathy; B and C. CT scan of brain 1 w, 2 w after treatment for hydrocephalus; D: CT scan of brain 1 month after treatment for hydrocephalus, the edema gradually reduced, and the abnormal signal disappeared. CT: Computed Tomography. Since the patient was unable to leave breathing machine, 2 w after the operation, her trachea was cut off with sputum aspiration by bronchoscope discontinuously. One week later, breathing machine was stopped, and tube oxygen was into trachea. The patient kept taking sodium valproate for treatment of epilepsy. One month later, the patient's condition was stable, and then returned to the general ward of liver and gallbladder spleen and pancreatic surgery to continue treatment. During the treatment, the patient’s condition aggravated with several sudden convulsions, coma, pulmonary infection and systemic edema. After symptomatic treatment in SICU with positive anti-infection treatment, the patient’s condition became better and got off ventilator support gradually, finally, she was sent back to common ward. The patient was discharged from the hospital after 4 months and her condition was relatively stable. At present, the she is treated with symptomatic and supportive treatment, and timely reviewed to monitor the disease. Since first described in 1996 by Hinchey et al. , PRES is defined to be a clinical presentation of reversible subcortical vasogenic brain edema. It is caused by endothelial injury, induced by abrupt changes in direct effects of cytokines on the endothelium or blood pressure alteration and will result in the destruction of the blood brain barrier and excessive exudation into the brain parenchyma. Generally, several symptoms such as seizure activity, visual abnormalities, headache, nausea/ vomiting and focal neurological signs usually occur when PRES take place. Studies have reported that PRES is associated with various conditions like hypertensive emergencies, renal failure, fluid overload and organ transplant . Studies showed that 0.5-5% solid organ transplant recipients will experience PRES. Hammerstrom et al. reported that the incidence of PRES has been reported as high as 8% in solid organ transplant recipients when patients receiving tacrolimus . In this case, our patient demonstrated serious tic of limbs 3 d after surgery, head CT indicated bilateral frontal parietal occipital cortex and coronal radiation edema complicated with intracranial hemorrhage, and the left anterior limb of the internal capsule and basal ganglia infarction undetermined. Since in patients with PRES, brain imaging studies usually show vasogenic edema predominantly involving the bilateral parieto-occipital regions  which was in consistent with this case, we identified the patient as reversible posterior white matter encephalopathy. Jr et al. conducted a retrospective analysis of 1923 adult of liver transplant recipients and found PRES occurred in 19 patients (1%), with 84% of cases occurring within 3 months postoperatively . In the present case PRES occurred only three days after surgery with no premonition. There are also several studies reporting PRES associated with using of tacrolimus. Barbas et al. reported a case of PRES associated with tacrolimus and sirolimus after multivisceral transplantation. However in this case, the patient didn’t receive any tacrolimus or sirolimus. PRES is a well-known but uncommon complication. Despite of its famous reputation, the pathological understanding of PRES is still poor and more clinical data is still needed. It was reported that Seizure was the most common clinical manifestation in the PRES which was also our patient’s symptom. Also Jr et al. showed almost 31% patients with PRES had an intracranial hemorrhage which was also found in this case. These evidences may be related to pathway of vascular dysregulation/damage and seizures and intracranial bleeding may be the final manifestation, which needs more researches and clinical data to further illuminate. In conclusion, in the present case, we reported a patient with reversible posterior white matter encephalopathy complicated with cerebral hemorrhage after orthotopic liver transplantation. The case was rare in clinic and the report might contribute to more clinic evidences as well as deeper understanding to PRES. This study is supported by Effects of ischemic white matter lesions on cognitive function: a mechanism based neuroimaging study (No. 81271309). Lerut J, Gordon RD, Iwatsuki S. Surgical complications in human orthotopic liver transplantation. Acta Chirurgica Belgica 2011; 87: 193-204. Raj S, Overby P, Erdfarb A. Posterior reversible encephalopathy syndrome: incidence and associated factors in a pediatric critical care population. Pediatr Neurol 2013; 49: 335-339. Kim SJ, Im SA, Lee JW. Predisposing factors of posterior reversible encephalopathy syndrome in acute childhood leukemia. Pediatr Neurol 2012; 47: 436-442. Yamada A, Ueda N. Age and gender may affect posterior reversible encephalopathy syndrome in renal disease. Pediatr Nephrol 2012; 27: 277-283. Fernandez D, El-Azzabi TI, Jain V. Neurologic problems after pediatric liver transplantation and combined liver and bowel transplantations: a single tertiary centre experience. Transplantation 2010; 90: 319-324. Barbas AS, Rege AS, Castleberry AW. Posterior reversible encephalopathy syndrome independently associated with tacrolimus and sirolimus after multivisceral transplantation. Am J Transplant 2013; 13: 808-810. Wong R, Beguelin GZ, De LM. Tacrolimus-associated posterior reversible encephalopathy syndrome after allogeneic haematopoietic stem cell transplantation. Br J Haematol 2003; 122: 128-134. Hinchey J, Chaves C, Appignani B. A reversible posterior leukoencephalopathy syndrome. New Engl J Med 1996; 334: 494-500. Legriel S, Schraub O, Azoulay E. Determinants of recovery from severe posterior reversible encephalopathy syndrome. Plos One 2012; 7: 44534-44534. Hammerstrom AE, Howell J, Gulbis A. Tacrolimus-associated posterior reversible encephalopathy syndrome in hematopoietic allogeneic stem cell transplantation. Am J Hematol 2013; 88: 301-305. Song T, Rao Z, Tan Q. Calcineurin inhibitors associated posterior reversible encephalopathy syndrome in solid organ transplantation: report of 2 cases and literature review. Medicine 2016; 95. Jr CR, Dimartini A, Akhavanheidari M. Posterior reversible encephalopathy syndrome in liver transplant patients: clinical presentation, risk factors and initial management. Am J Transplant 2012; 12: 2228-2236.